March offers a variety of wildlife attractions that include close-up looks at wintering species that haven’t yet left the region, along with other species beginning to stir as spring arrives and weather gradually warms. Both day and night, Lloyd Center outings sought to capture the various scenes, and the lively landscape did not disappoint. On two Saturdays in March during the annual Lloyd Center Seal Watches to Cuttyhunk for which we partner with the Cuttyhunk Ferry Company each year, we ventured out to view seals hauled out on Gull Island, a small sandbar between Cuttyhunk and Penikese where wintering seals can be seen in high numbers. 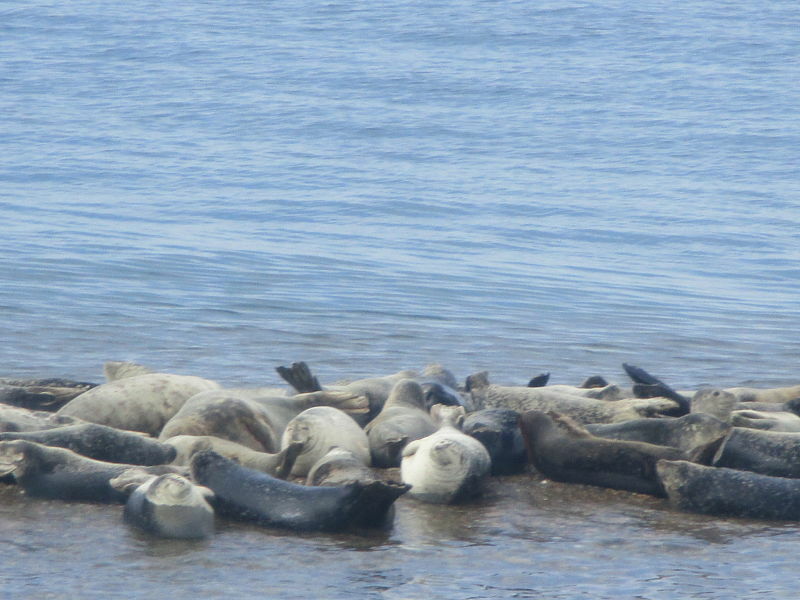 The two common species are Harbor seals, which are mostly wintering individuals that breed further north, and the Grey Seal which breeds in the region and whose pups may be seen on these winter outings. 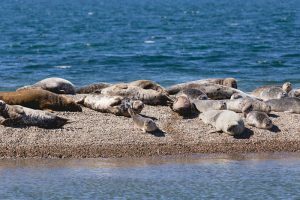 On the first outing that took place on March 10, choppy seas did not deter the seals or the Snowy Owl which was also present and visible from the boat as we reached the Cuttyhunk shoreline. 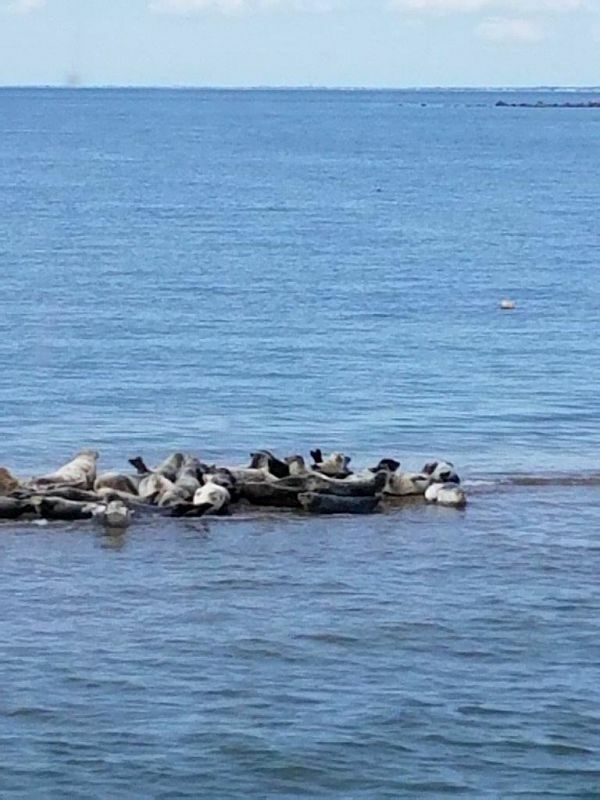 Choppy conditions allowed views of seals swimming and huddled together on the bar, including the puppy-faced Harbor seals in banana-shaped poses on rocks, and the larger, long-nosed Grey Seals taking up lots of space on the sand. Other birdlife included nice looks at Great Cormorants perched on Gull Island close to where seals were hauled out. 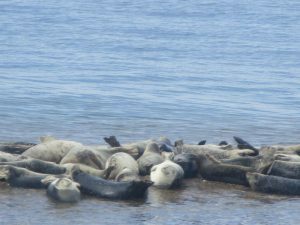 On the second outing on March 24, calmer seas and warmer temperatures yielded stellar looks at the seals once again, with larger numbers huddled on the bar and allowing close approach. This time two Snowy Owls were there to greet us and great looks were possible through our spotting scope. The calmer waters allowed for better waterfowl viewing, including Common Loons in the Cuttyhunk Pond visible at close range. On this warmer and truly spring-like day, even five deer were seen walking along the far shore of the pond, not far from where an owl stood. In addition to receiving education about the seals, guests received some background and history about the Elizabeth Island chain and Cuttyhunk, from both a geologic and land use perspective on both outings. A large portion of Cuttyhunk is a “drumlin”, or mound of rock deposited when a glacier receded. Guests gained a vivid sense of this hilly terrain on their walk to the lookout. Two evening outings that targeted secretive birds included both an owl and a woodcock walk. On March 22, a small group enjoyed a calm, warm evening that followed yet another nor’easter, and provided optimal conditions for owl observation at the Lloyd Center property. Although the Barred Owl pair that showed themselves prior to sunset became more subdued when darkness fell, patrons heard the loud screeches and calls loud and clear. And it appears now that the pair, feared to have departed, is in fact nesting somewhere on the Lloyd Center property. Prior to sunset, folks did catch a glimpse of Koko the Screech Owl, which was brought out for show to start the outing. Our last outing of the month took place on March 27, when a small group enjoyed stunning views of a lone displaying male American Woodcock at Noquochoke Wildlife Management area, where open areas and low shrubby habitat which the species requires for its life cycle are maintained. In addition to seeing the bird close up using a flashlight, onlookers heard the “peent” call, and witnessed both the ground dance and aerial display when the bird spirals hundreds of feet into the air. Finally, the twittering sound as the bird descended was heard and quite useful when darkening skies made tracking the bird a challenge. On a night offering perfect conditions, the “Timberdoodle” did not disappoint. Join us for other walks in the months ahead, and these feature outings in March 2019!